Home » valsalva » How Can Nasal Obstruction CAUSE Clogged Ears? Now when the patient's nose gets obstructed, it may mean the nasal lining has become swollen making it difficult to breath. It also means the tunnel that goes up into the ear may be swollen shut as well. As such, it may become difficult if not impossible to pop the ears. This is known as eustachian tube dysfunction. However, there is a more active process that may lead to ear clogging beyond just mucosal swelling of the eustachian tube. When the nose is obstructed, every time the patient tries to breath in thru the nose, negative pressure is built up in the back of the nose where the eustachian tube opening is located. As such, this negative pressure inside the nose can get transmitted up into the ear resulting in negative pressure to slowly build up in the ear as well which can ultimately cause a clogged ear sensation. This is just like sucking on a straw to draw fluid out of a cup, though in this case, the straw is analogous to the eustachian tube, the fluid is air, cup is the ear, and the mouth is the nose. In fluid dynamics, Bernoulli's principle states that for an inviscid flow, an increase in the speed of the fluid occurs simultaneously with a decrease in pressure. To use an example, if you are driving a car with the window down, the fast-moving air outside the car creates a negative pressure inside the car causing things to not just blow around, but does cause some suction effect to things within the car (paper inside the car potentially getting "sucked" to the outside). When the nose becomes clogged, airflow increases in the back of the nose (think garden hose where you have the same amount of water flow, but by changing the nozzle diameter, flow can be increased by making diameter smaller or decreased by making diameter larger). Due to Bernoulli's principle, negative pressure builds up inside the ear due to this increased nasal airflow. This negative pressure can be transmitted into the ear causing it to become clogged. 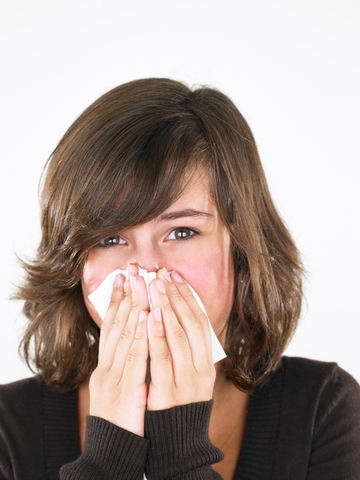 So there you have it... 3 reasons why a clogged nose can lead to clogged ears! That also means that often, if you just treat the clogged nose... the clogged ears will get better as well!